Modern Office Methods (MOM) is the recipient of the 2017 RFG Circle of Excellence award from Ricoh for our commitment to customer service. The MOM service team, under the direction of Ken Staubitz, Vice President of Service, has worked hard to perfect their skills and we are thrilled that this extra effort has paid off. Ricoh recognizes that it has partnered with the best Dealer Network in the industry and they reward the “Best of the Best”. MOM has been recognized as a 2017 RFG Circle of Excellence authorized service dealership. 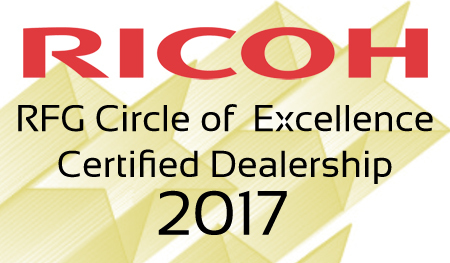 This program is designed to recognize dealers who provide outstanding service and support in accordance with Ricoh’s guidelines. Excellent client support has always been a tradition at MOM and our efforts have been rewarded many times in the past. We are a 2-Time imageSource Magazine’s Perfect Image Award Winner for Outstanding Service Program. Out of 3,743 independent dealers across the nation, MOM has been recognized multiple times for our commitment to service excellence. Many congratulations on winning the award. Your company has been doing a wonderful job in making these state of the art products. You rightly deserved the award.